Serbian hevayweight Jovo Pudar, 30-4, who lost a decision to Ruslan Chagaev last time out, will return to the ring early next year and have tuneup January 15 before moving in on bigger fights. 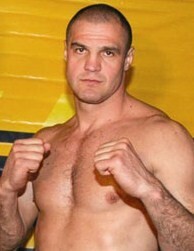 The 42-year od Pudar (pictured) turned pro in 95 in the US and was out of from 2004 through 2010 before making a comeback fighting out of Belgrade. Pudar is ranked # 12 by the WBA and was reportedly close to fight vs then WBA regular champ Alexander Povetkin. The fight never materialized but on the undercard to Klitschko vs Povetkin Pudar fought Chagaev and lost. WBC # 1 Supermiddle Marco Antonio Periban, fresh off a draw to Badou Jack in his last fight, might fight Montenegrian Nikola Sjekloca, 26-1, in March in the US. The fight is not a done deal yet. Sjekloca´s sole loss came against Sakio Bika in a WBC eliminator. Sauerand Promotion have offered Danish veteran Rudy Markussen, out since losing to Brian Magee in a fight for the WBA interim supermiddle title early 2011, a shot at reigning EU lightheavy champ Erik Skoglund. The fight was by some sources announced as on for January 18 in Frederikshavn but Markussen told Danish paper BT that he wouldn´t be ready by then but had told Sauerland he would be ready in March of April. Hardpunching Congolese cruiser Youri Kalenga, 17-1, will face Brit Hari Miles 9-8 on the undercard to Kiko Martinez´s defence of the IBF superbantam title against Jeffrey Mathebula. EBU superwelter champ Sergey Rabchenko have now Italian Emanuele Della Rosa as mandatory challenger. The fight have January 21 at noon as deadline for purse bids. Rabchenko is ranked # 1 by the WBC while Della Rosa is # 5 so this effectively also a world title eliminator. Rabchenko is promoted by Hatton Promotions and managed by Philippe Fondu while Della Rosa is with OPI 2000.